Kimi Raikkonen says the SF15-T already feels "pretty nice" compared to last year's car and gives Ferrari a good base to work with for the 2015 season. 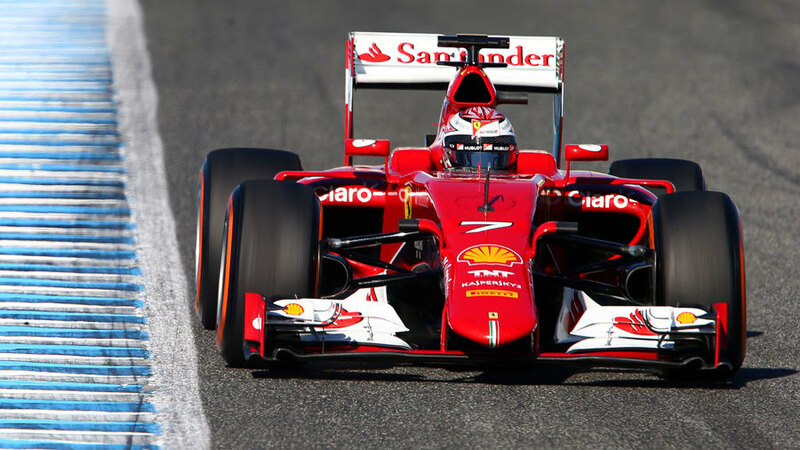 Raikkonen rounded off the Jerez test by topping the time sheets, the fourth day a Ferrari-powered car has gone fastest at the Spanish circuit. It's been an encouraging start for Ferrari and Raikkonen, who accumulated 197 laps in two days, is pleased with the team's new car compared to the uncompetitive F14-T.
"For sure it's much better than what we had last year," Raikkonen said. "I think the whole package is better all-round; the engine and the car itself, everything has improved. Obviously we still have a lot of hard work to try and improve things but it's a good starting point." The morning started off wet before the track dried off later in the day, and Raikkonen was happy with how the car handled both conditions. "We didn't do so many laps but it felt pretty nice compared to last year, and it's the same for the dry, the car is behaving well." The Ferrari team has topped three of the four days in Jerez, with Mercedes not finishing as high as third, but Raikkonen does not think headline times are significant. "It doesn't mean much. The lap time can be anything but we've got a good amount of laps and things are working, we're not really having many issues. That's the main thing plus the feeling is pretty fine, so that's good. We do our own stuff, we don't know what the others are doing. Yesterday I said we had a good starting point and the team has done a good job over the winter to prepare this car. We have something to work with now."